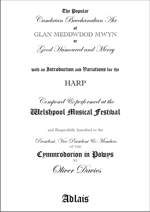 Oliver Davies's Glan Medd'dod Mwyn (Good Humoured and Merry) was first heard from the platform of the Shire Hall, Welshpool on the occasion of the 'Powys Eisteddfod and Cambrian Grand Musical Festival', held on the 7th, 8th and 9th of September, 1824. 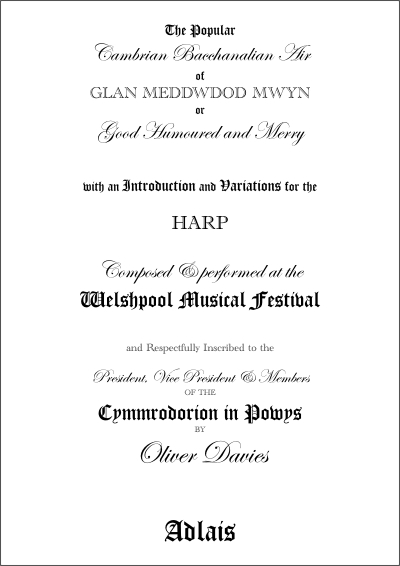 Other activities at this Eisteddfod included competitions for harp-playing and Cerdd Dant, described in the press report as singing to harp accompaniment 'after the manner of the Ancient Britons'. In another competition, 10 contestants competed for the 'Silver Harp' - a medal which was won by Henry Humphreys of Welshpool, playing variations on Merch Megan. 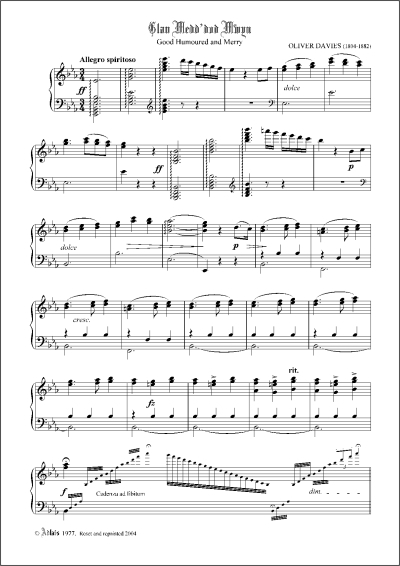 Second came John Jones of Dolgellau playing variations on Sweet Richard. Known as John Wood Jones, he was subsequently employed as household harpist to Lady Llanover.